The passing of a loved one is not only challenging for us to deal with as humans but it is also challenging for our dogs. Our dogs are very empathic. As a result, they are feeling their own emotions as well as their human companions emotions. One of the best ways to help your dog is to process your own emotions separate from your dog. 1.) Salt Lake City dog training owners, we highly recommend that you take advantage of the amazing healing modalities that are available for yourself. Taking care of yourself will help your dog. Go to counseling, do some EFT, receive Reiki / Hypnosis, or do some acupressure on yourself. 2.) Learn about Tellington TTouch and do this daily on your dog. 3.) Give your dog flower essences. We love Christina Blume as she has many flower essence options. 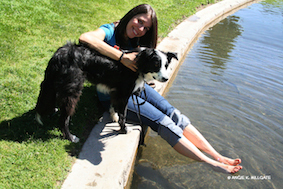 In fact, she has helped many of our dog training, Salt Lake City, clients. 4.) Do fun activities with your dog. Exercise your dog more often if possible and take your dog out to do fun things. This will help release endorphins. 5.) Keep your dog’s same routines. 6.) Let your dog know that you here for him, and that he is not having to go through this alone. He needs support. 7.) Your dog will still enjoy using his mind and bonding with you. So make sure you do plenty of dog training. Salt Lake City has plenty of opportunities for this. 8.) If you have any item (clothing, crate, etc) from the person or animal that has passed let your dog smell them. Help them process that a transition has happened. 9.) Give your dog plenty of extra attention such as treats, cuddles, toys and playtime. We want to hear from you in a comment below. Our condolences are with you. Please let us know how the above post has helped you during this tough time for your dog.